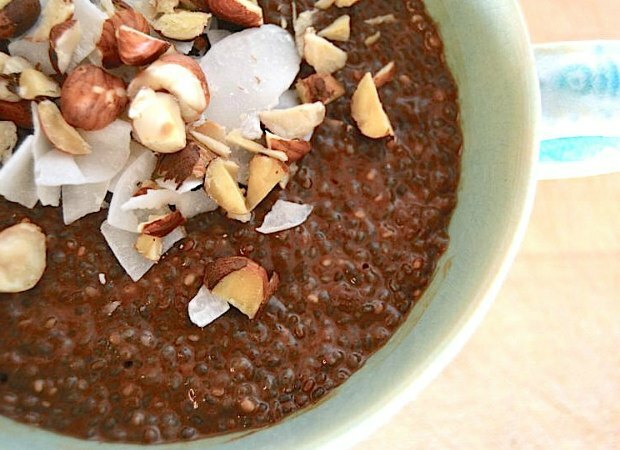 This raw cacao chia pudding tastes amazing. 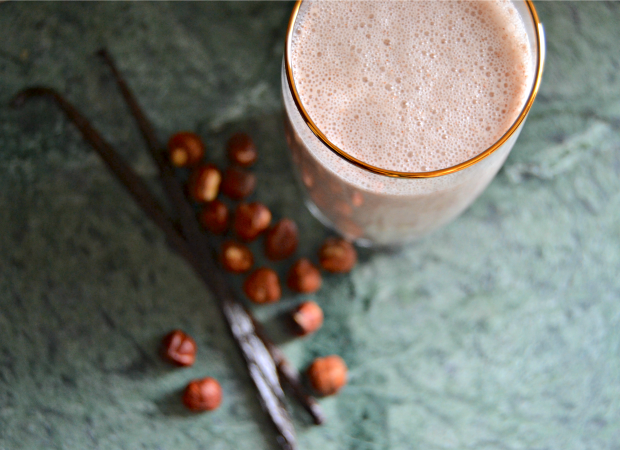 It’s good for you as well, which might be hard to believe as it looks and tastes decadent enough to be a dessert. However, with all the ingredients added to this it’s incredibly healthy and filling enough for breakfast or anytime. Chia seeds are a bit strange when you first experiment with them and can be a bit of an odd texture but I promise when mixed with raw cacao, it tastes delicious and will have you eating them in no time! They’re great in smoothies, sprinkled on top of porridge or yogurt, or added to baked goods. You can even use them to replace eggs in recipes. Probably one of the best things about this recipe is that it takes no time at all to prepare. Just mix everything the night before and you’ll wake up to a bowl full of superfood goodness! In a bowl, mix together well your milk and chia seeds allowing the seeds to become incorporated with the liquid. Set aside for a couple of minutes to “gel” then mix the rest of your ingredients in until everything is nicely combined. Pop in the fridge overnight until you’re ready to eat in the morning. Sprinkle with whatever toppings you like. I used hazelnuts and flaked coconut but you could add anything you like: nuts and/or seeds, granola, fruit, etc. Raspberries would be a great addition with the chocolate! Sometimes even with the best intentions and in making something you’ve made countless times, things with cooking and baking don’t quite work out the way they’re meant to. But sometimes that actually happens for a reason and that reason in this case was a delicious one! I was aiming to make my usual nut butter but in soaking the nuts beforehand I was left with nuts that simply wouldn’t become “butter”. Even though soaking nuts is a healthier way to consume them, it doesn’t necessarily make for good nut butter. Soak the cashews and hazelnuts overnight (or minimum 4 hours) When ready to use, drain and rinse the nuts then blend in food processor until fine and crumbly. Add the dates and pulse for a few seconds before adding the rest of the ingredients, blending until fully combined. 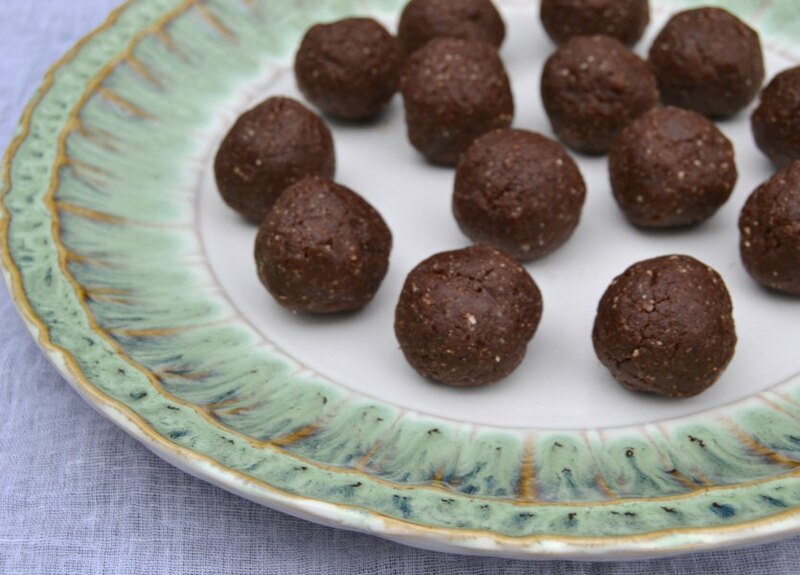 Make the balls by taking tablespoons of the mixture and rolling into shape. Place on a lined baking tray and pop in the fridge until ready to serve.